When Nexus 5 was first launched, it was termed as the smartest phone by Google ever. As per the latest news and rumours in the market, Google’s Nexus 5 (LG) which got discontinued in early 2015 after the launch and success of Moto Nexus 6 is supposedly set to return to the market in a revamped state. There were rumours in May, 2015 which stated that Google has been making alliance with Huawei and LG in order to launch 2 smart phones in 2015. The one with Huawei would be a 5.7 inch phablet and the one with LG would be a 5.2 inch redesigned Nexus 5. Tech-savvy people all over the world have been keeping close eye on these rumours because often the rumour mills report stuff which are quite contrary to the exact news. Recently a photo tweet leaked by video producer and internet personality, Marques Brownlee created buzz among people regarding the new Nexus 5 which is rumoured to be launched in October, 2015. The company has always launched new models in the month of October. Hence the speculation of an October launch is made. The leaked picture has made the speculation even stranger and people can’t wait to see what Google is going to do with the old model with a new twist. The expectations from Google is sky high and it remains to be seen as to whether or not Google manages to live up to the same. 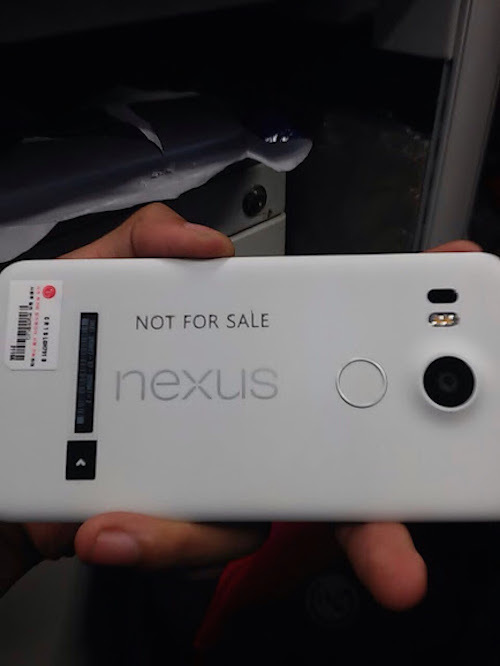 The leaked picture is of a white smart phone which has Nexus written over its back. There is also a small white sticker at the bottom of the device which has a red circle on it. It appears to be the LG brand logo and thus the picture is speculated to be that of the LG version and not the Huawei one. We get to see a camera lens at the top which seems to be slightly protruded from the base. Just below the camera lens is a round circle with steel or may be a plastic rim and is believed to be a fingerprint scanner. There is also a Not for sale label on the phone’s back. The nexus branding on the phones back is making people believe that it is none other than the talked about Nexus 5 by LG. This leaked photo closely matches renders of the assumed LG device, which was leaked last week. Renders that presumably show the rumoured Nexus 6 by Huawei had also leaked at that same time. It was based on the blueprints of the device that was sent to third party manufacturers for accessories before the launch of the phone. A Huawei Nexus is believed to turn out beneficial for both Google and Huawei as both companies can strengthen their position in China and U.S respectively. With no official launch date declared for the phones all we can do is wait for any other photo leaks which help us in either confirming the rumours or totally puts them off. There has been no official confirmation as such about this new model by Google which makes it even harder to trust these rumours. However, the pictures showing the design look to be authentic enough and it has definitely aided in positive publicity for the brand. When the model is finally launched, we will come to know as to how true the leaked pictures were. We are eagerly waiting to see an official picture of the device. If the leaked pictures turn out to be true, it is highly likely that the sales for new Nexus 5 are going to peak again.